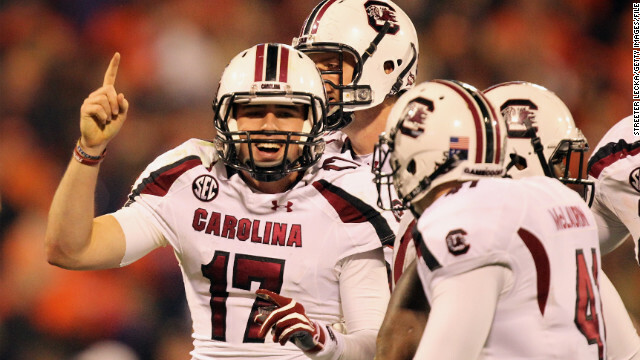 Dylan Thompson celebrates during South Carolina's victory over Clemson last November. (CNN) - Ask Dylan Thompson to name his career highlights, and fans might expect to hear about one of his big moments as South Carolina's backup quarterback - like the time he led the Gamecocks to victory over rival Clemson, or when he threw the game-winning touchdown with 11 seconds left in the Outback Bowl. His desire to spread the Gospel and share his faith propelled Thompson and his mentor, Jack Easterby, to come up with The Bible Out Loud project, an online initiative aimed at getting Christians to memorize and recite Scripture. After the 27-17 victory over Clemson last November, Thompson felt he was receiving far too much attention. Not that it was undeserved: he threw for 310 yards and three touchdowns. But Thompson says the number of touchdowns he scores pales in comparison to what’s really important. “We need to get the attention back on Jesus,” he said. The rules for The Bible Out Loud project are simple: Participants memorize one to five verses from the New International Version of the Bible and record themselves reciting it. Then they upload their video to YouTube and copy and paste the link to the project's web site. Thompson said it's something people can do regardless of their denomination, social status or income, and it puts the focus back where he says it should be, on God’s word. He recognizes that his status on the football field gives him a “tremendous opportunity to share” his testimony and lead others down the path to faith. Easterby, who is the executive director of The Greatest Champion Foundation, agrees. The promotional video for Bible Out Loud features several South Carolina athletes, but they're not named in an effort to keep the focus on Scripture. But diehard Gamecock fans will recognize them, and college fans will likely recognize running back Marcus Lattimore, who suffered a season-ending injury that brought everyone in Williams-Brice Stadium to their feet back in October. Thompson said he’s even talked South Carolina head football coach Steve Spurrier into reading a verse for the project. “He told me he was proud of me for doing it,” Thompson said. Easterby understands there is often skepticism when it comes to religion, but he stresses the project involves no money and is pure in its intentions. He said Christians often face persecution when spreading their message, but so far backlash to the Bible Out Loud project has been minimal. “A lot less than I had anticipated,” he laughs. Most of the responses have been positive, and the project's goal of having an entire video Bible online by the end of the year is well on its way to being completed. Less than three weeks in, Easterby said more than 1,000 of the 31,000-plus verses have already been submitted. There's been no shortage of variety, either, which is what Thompson said he’d hoped for. Among the videos posted online: a couple standing outside next to a lake reciting Proverbs 12:2-3; schoolchildren in uniform reciting 2 Timothy 2:15; and a boy wearing his football jersey reciting Acts 16:31. The influx of submissions has let Easterby, who views each video before posting it to the site, be more selective. “The Bible is meant to be read joyfully,” he said. Easterby has been in contact with submitters who aren’t speaking clearly or loudly enough on the video, asking them to resubmit. The task of going over the videos with a watchful eye is challenging, but he said he wouldn’t want it any other way. Einstein's Gravity Theory Passes Toughest Test Yet..............................E = mc2..........(U–Pb).................two math formulas..........that do not lie or sin !!! Makes me love SC even more!!! 4. Hinduism (from an online Hindu site) – "Hinduism cannot be described as an organized religion. It is not founded by any individual. Hinduism is God centered and therefore one can call Hinduism as founded by God, because the answer to the question ‘Who is behind the eternal principles and who makes them work?’ will have to be ‘Cosmic power, Divine power, God’." The caste/laborer system, reincarnation and cow worship/reverence are problems when saying a fair and rational God founded Hinduism." The caste system, reincarnation and cow worship/reverence. 5. Buddhism- "Buddhism began in India about 500 years before the birth of Christ. The people living at that time had become disillusioned with certain beliefs of Hinduism including the caste system, which had grown extremely complex. The number of outcasts (those who did not belong to any particular caste) was continuing to grow." "However, in Buddhism, like so many other religions, fanciful stories arose concerning events in the life of the founder, Siddhartha Gautama (fifth century B.C. ):"
Archaeological discoveries have proved, beyond a doubt, his historical character, but apart from the legends we know very little about the circu-mstances of his life. e.g. Buddha by one legend was supposedly talking when he came out of his mother's womb. Bottom line: There are many good ways of living but be aware of the hallucinations, embellishments, lies, and myths surrounding the founders and foundations of said rules of life. Prophecy: Psalm 55:12-14 For it is not an enemy who reproaches me, Then I could bear it; Nor is it one who hates me who has exalted himself against me, Then I could hide myself from him. 13 But it is you, a man my equal, My companion and my familiar friend. 14 We who had sweet fellowship together, Walked in the house of God in the throng. (See also Psalm 41:9; Zech 13:6). Fulfillment: Matthew 26:49-50 And immediately he went to Jesus and said, “Hail, Rabbi!” and kissed Him. 50 And Jesus said to him, “Friend, do what you have come for.” Then they came and laid hands on Jesus and seized Him. Prophecy: Zechariah 11:13 Then the LORD said to me, “Throw it to the potter, that magnificent price at which I was valued by them.” So I took the thirty shekels of silver and threw them to the potter in the house of the LORD. NOTE: Notice that in both prophecy and fulfillment we find stated that (1) it was silver; (2) there were 30 pieces (Matt. 27:3); (3) they were thrown down; (4) they were cast down in the House of the Lord; and (5) the money was used to purchase the potter’s field. Prophecy: Psalm 35:11 Malicious witnesses rise up; They ask me of things that I do not know. Fulfillment: Matthew 26:59-60 Now the chief priests and the whole Council kept trying to obtain false testimony against Jesus, in order that they might put Him to death; and they did not find any, even though many false witnesses came forward. But later on two came forward, . . .
Prophecy: Isaiah 50:6 I gave My back to those who strike Me, And My cheeks to those who pluck out the beard; I did not cover My face from humiliation and spitting. Fulfillment: Matthew 27:30 And they spat on Him, and took the reed and began to beat Him on the head. NOTE: Note here the details that correspond in both prophecy and fulfillment (1) He was to be smitten, (2) He was to be smitten on the face (as well as the other parts of the body). See Luke 22:64. (3) He was to be spit upon, and (4) He was to be spitten upon in the face. Prophecy: Isaiah 53:7 He was oppressed and He was afflicted, Yet He did not open His mouth; Like a lamb that is led to slaughter, And like a sheep that is silent before its shearers, So He did not open His mouth. Fulfillment: Matthew 27:12-14 And while He was being accused by the chief priests and elders, He made no answer. Then Pilate said to Him, “Do You not hear how many things they testify against You?” And He did not answer him with regard to even a single charge, so that the governor was quite amazed. Prophecy: Isaiah 53:5 But He was pierced through for our transgressions, He was crushed for our iniquities; The chastening for our well-being fell upon Him, And by His scourging we are healed. Prophecy: Psalm 109:24 My knees are weak from fasting; And my flesh has grown lean, without fatness. Fulfillment: John 19:17 They took Jesus therefore, and He went out, bearing His own cross, to the place called the Place of a Skull, which is called in Hebrew, Golgotha. Luke 23:26 And when they led Him away, they laid hold of one Simon of Cyrene, coming in from the country, and placed on him the cross to carry behind Jesus. NOTE: Evidently the Lord was so weak that His knees gave way under the weight of the heavy cross. So they had to put it on another. Prophecy: Psalm 22:16 For dogs have surrounded me; A band of evildoers has encompassed me; They pierced my hands and my feet. Fulfillment: Luke 23:33 And when they came to the place called The Skull, there they crucified Him and the criminals, one on the right and the other on the left. NOTE: Christ was crucified in the customary Roman manner, the hands and feet being pierced by huge spikes which fastened the body to the wooden cross. See John 20:25-27 “ . . . except I shall see in His hands the print of the nails, and put my finger into the print of the nails . . . Then said He (Jesus) to Thomas, reach hither thy finger and behold My hands,” etc. Prophecy: Isaiah 53:12 Therefore, I will allot Him a portion with the great, And He will divide the booty with the strong; Because He poured out Himself to death, And was numbered with the transgressors; Yet He Himself bore the sin of many, And interceded for the transgressors. Fulfillment: Luke 23:34 But Jesus was saying, “Father, forgive them; for they do not know what they are doing.” And they cast lots, dividing up His garments among themselves. Here Jesus, as foreseen by Isaiah, “interceded for the transgressors” who nailed him to the cross. Prophecy: Psalm 109:25 I also have become a reproach to them; When they see me, they wag their head. Fulfillment: Matthew 27:39 And those passing by were hurling abuse at Him, wagging their heads. Prophecy: Psalm 22:18 They divide my garments among them, And for my clothing they cast lots. NOTE: How exact the inspired prophecy! The garments were to be parted among them, but the vesture was to be awarded to one by lots. These were statements that would appear almost contradictory unless explained by the record of the scene at the cross. Prophecy: Psalm 22:1 For the choir director; upon Aijeleth Hashshahar. A Psalm of David. My God, my God, why hast Thou forsaken me? Far from my deliverance are the words of my groaning. Prophecy: Psalm 69:21 They also gave me gall for my food, And for my thirst they gave me vinegar to drink. Fulfillment: John 19:28-29 After this, Jesus, knowing that all things had already been accomplished, in order that the Scripture might be fulfilled, said, “I am thirsty.” 29 A jar full of sour wine was standing there; so they put a sponge full of the sour wine upon a branch of hyssop, and brought it up to His mouth. Prophecy: Psalm 31:5 Into Thy hand I commit my spirit; Thou hast ransomed me, O LORD, God of truth. Fulfillment: Luke 23:46 And Jesus, crying out with a loud voice, said, “Father, into Thy hands I commit My spirit.” And having said this, He breathed His last. Prophecy: Psalm 38:11 My loved ones and my friends stand aloof from my plague; And my kinsmen stand afar off. Fulfillment: Luke 23:49 And all His acquaintances and the women who accompanied Him from Galilee, were standing at a distance, seeing these things. Prophecy: Psalm 34:20 He keeps all his bones; Not one of them is broken. NOTE: It is profitable to notice two other prophecies concerning His bones which undoubtedly had an exact fulfillment, although such is not stated in Scripture in so many words. We draw our conclusions from honest inference. (1) Psalm 22:14 “All my bones are out of joint.” Hanging on the cross by the hands and feet would easily disjoint the bones, especially when we remember that the body was fixed to the frame while lying on the ground. (2) Psalm 22:17 “I may tell all My bones.” He was left hanging on the cross naked (John 19:23) and all His bones could thus easily be seen. The extension of the body and the wasting pangs of crucifixion would make the bones more prominent than usual. Prophecy: Psalm 22:14 I am poured out like water, And all my bones are out of joint; My heart is like wax; It is melted within me. Fulfillment: John 19:34 but one of the soldiers pierced His side with a spear, and immediately there came out blood and water. NOTE: The blood and water running out of the pierced side presented an evidence that the heart had literally burst. Prophecy: Amos 8:9 “And it will come about in that day,” declares the Lord GOD, “That I shall make the sun go down at noon And make the earth dark in broad daylight. Fulfillment: Matthew 27:45 Now from the sixth hour darkness fell upon all the land until the ninth hour. NOTE: The Jews reckoned twelve hours from sunrise to sunset. This would make the sixth hour about noon, and the ninth hour near three o’clock. Prophecy: Isaiah 53:9 His grave was assigned with wicked men, Yet He was with a rich man in His death, Because He had done no violence, Nor was there any deceit in His mouth. Fulfillment: Matthew 27:57-60 And when it was evening, there came a rich man from Arimathea, named Joseph, who himself had also become a disciple of Jesus. 58 This man went to Pilate and asked for the body of Jesus. Then Pilate ordered it to be given over to him. 59 And Joseph took the body and wrapped it in a clean linen cloth, 60 and laid it in his own new tomb, which he had hewn out in the rock; and he rolled a large stone against the entrance of the tomb and went away. The Fact: Gen. 3:15; Deut. 18:15; Psa. 89:20; Isa. 2:2; 28:16; 32:1; 35:4; 42:6; 49:1; 55:4; Ezek. 34:24; Dan. 2:44; Micah 4:1; Zech 3:8. The Time: Gen. 49:10; Num. 24:17; Dan. 9:24; Mal. 3:1. His Divinity: Psa. 2:7, 11; 45: 6-7, 11; 72:8; 102:24-27; 89:26-27; 110:1; Isa. 9:6; 25:9; 40:10; Jer. 23:6; Micah 5:2; Mal 8:1. Human Generation: Gen. 12:3; 18:18; 21:12; 22:18; 26:4; 28:14; 49:10; 2 Sam. 7:14; Psa. 18:4-6; 50:22-23; 89:4, 29-30; 132:11; Isa. 11:1; Jer. 23:5; 33:15. Isa. 40:3; Mal. 3:1; 4:5. Conversion of Gentiles: Isa. 11:10; Deut. 32:43; Psa. 18:49; 19:4; 117:1; Isa. 42:1; 45:23; 49:6; Hosea 1:10; 2:23; Joel 2:32. Psalm 50:3-6; Isa. 9:6-7; 66:18; Dan 7:13-14; Zech. 12:10; 14:4-8. Man, that's the longest, meaningless post I've read in a long time. The worst part is none of it matters at all. The bible is not a source of proof for anything. It could have helped the world more to have given us a chapter from a Stephen King novel. All that your post proves is that you study the Bible using the devotional method instead of the historical-critical method. Using the latter method tells quite a different story. Perfect. You used the bible to prove the bible. How incredibly original. What a marvel of logic and critical thinking. You win. No amount of physical evidence, archaeological research and field work, or reasoned and rational thought could possibly lead one to an opposing conclusion. The book is true because the book says so! Like yep, you choose to read the Bible using the devotional method as opposed to the historical critical method. Although the latter method is more time consuming, it results in quite a different story. Thank you for this exhaustive list. It once again shows just how religion can leave one with a staggeringly low intellect, an absolute inability to think critically. The fact that you honestly believe your ridiculously circular "logic" even begins to approach a reasoned, well-supported argument is all the proof needed to demonstrate the destructive power of religion. They are the Gamec ocks and they are going long. Am I the only one that finds this amusing?